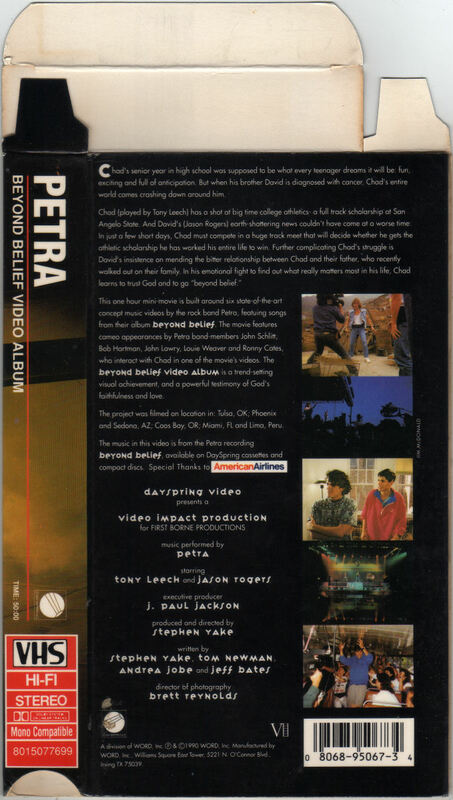 Chad's senior year in high school was supposed to be what every teenager dreams it will be: fun, exciting and full of anticipation. But when his brother David is diagnosed wiht cancer, Chad's entire world comes crashing down around him. 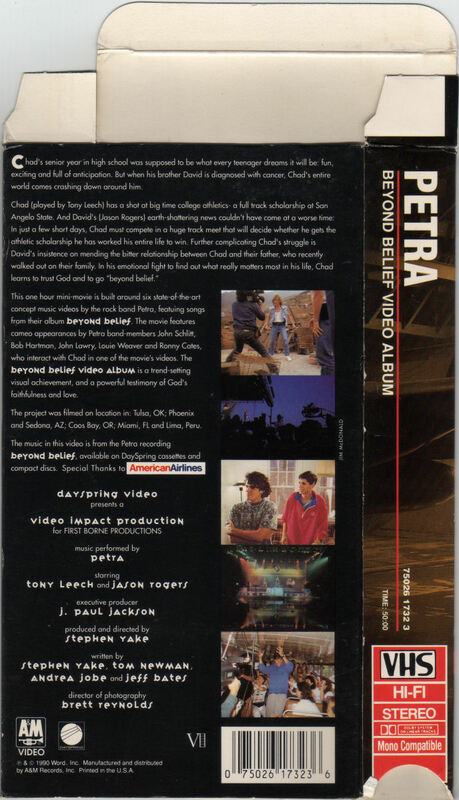 Chad (played by Tony Leech) has a shot at big time college athletics - a full track scholarship at San Angelo State. 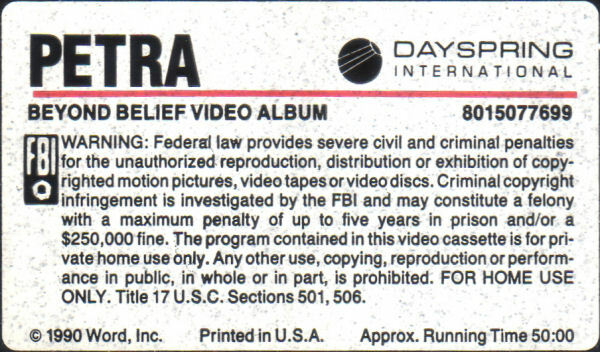 And David's (Jason Rogers) earth-shattering news couldn't have come at a worse time. 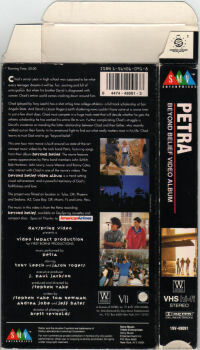 In just a few short days, Chad must compete in a huge track meet that will decide whether he gets the athletic scholarship he has worked his entire life to win. Further complicating Chad's struggle is David's insistence on mending the bitter relationship between Chad and their father, who recently walked out on their family. In this emotional fight to find out what really matters most in his life, Chad learns to trust God and to go "beyond belief". 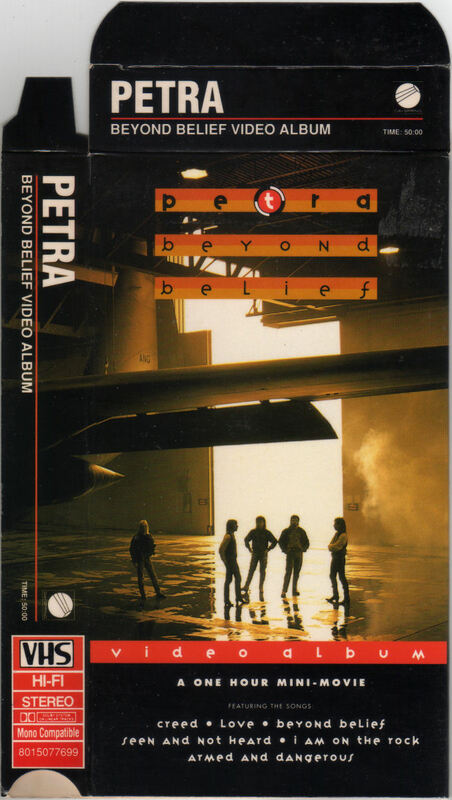 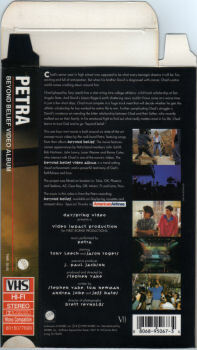 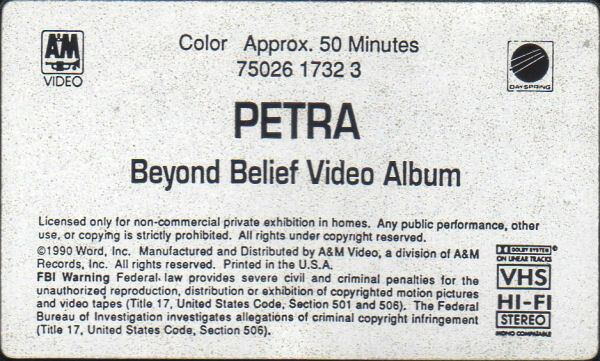 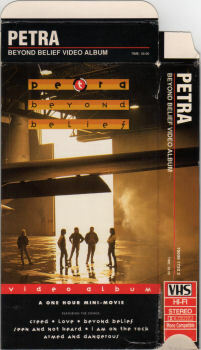 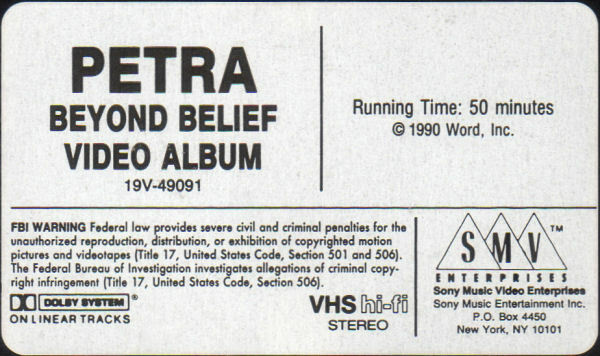 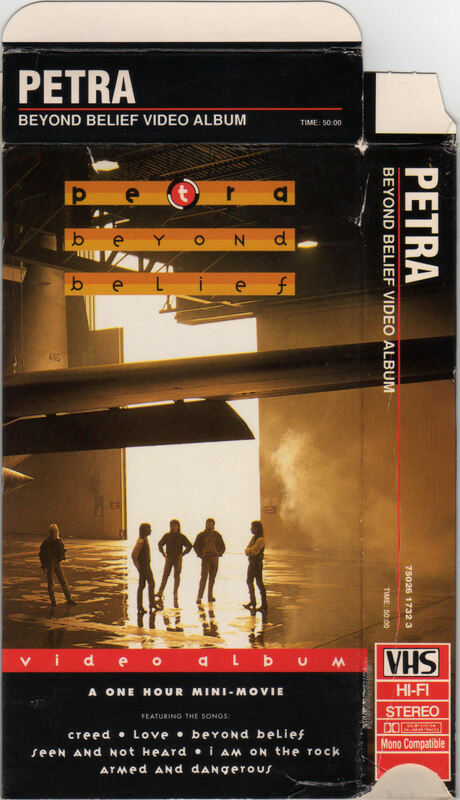 This one hour mini-movie is built around six state-of-the-art concept music videos by the rock band Petra, featuring songs from the album Beyond Belief. The movie features cameo appearances by Petra band-members John Schlitt, Bob Hartman, John Lawry, Louie Weaver and Ronny Cates, who interact with Chad in one of the movie's videos. The Beyond Belief Video Album is a trend-setting visual achievement, and a powerful testimony of God's faithfulness and love. The project was filmed on location in Tulsa, OK; Phoenix and Sedona, AZ; Coos Bay, OR; Miami, FL and Lima, Peru. 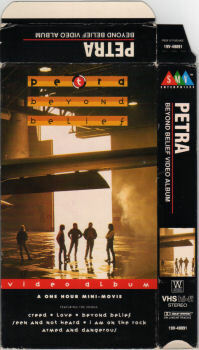 The music in this video is from the Petra recording Beyond Belief, available on DaySpring cassettes and compact discs. 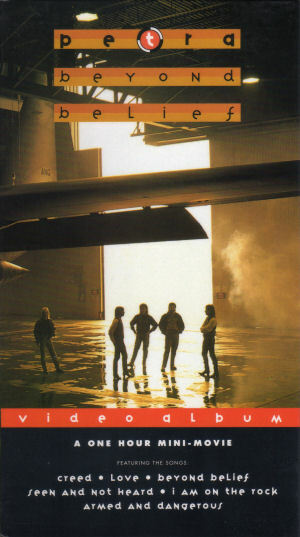 Special thanks to American Airlines. 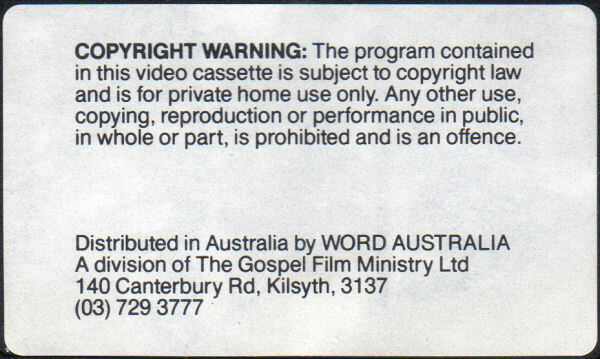 Dayspring, a division of Word, Inc.| (p) and © 1990 Word, Inc. | Manufactured by Word, Inc., Williams Square East Tower, 5221 N. O'Connor Blvd., Irving, TX 75039 | Label: Dayspring International | © 1990 Word, Inc. | Printed in U.S.A.
A&M Video | (p) & © 1990 Word, Inc. | Manufactured and distributed by A&M Records, Inc. | Printed in U.S.A. | Label: © 1990 Word, Inc. | Manufactured and distributed by A&M Video, a division of A&M Records, Inc. | Printed in U.S.A.
Dayspring, a division of Word, Inc.| (p) and © 1990 Word, Inc. | Manufactured by Word, Inc., Williams Square East Tower, 5221 N. O'Connor Blvd., Irving, TX 75039 | Label: Rosa, P.O. 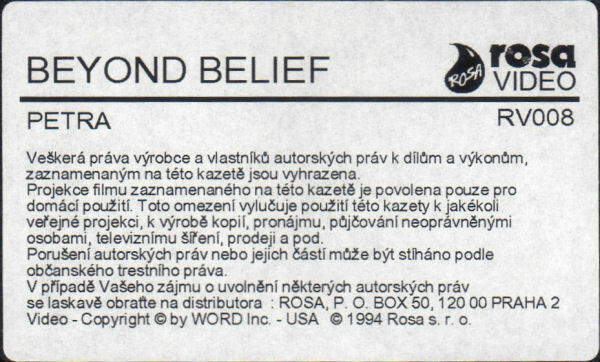 Box 50, 120 00 Praha 2 | Video - Copyright © by Word, Inc. - USA | © 1994 Rosa s. r. o.